A binding is a reference to an external framework (interface) that defines how the WSDL user will reach the implementation of services. This reference specifies the protocol and data format to be used in the request message defined by the associated interface. Each binding technique is specified in the WSDL and points to the server that has access to the actual implementation of your Web service. Policy Manager provides an extensible WSDL binding framework that supports out-of-the-box binding implementations as well as custom binding implementations. The Binding Framework includes APIs and extension points in the containers and also the Policy Manager Management Console user interface, though these portions of the framework are independent of each other. In some situations, only the user interface of the Management Console is extended for a type of binding. This is the case when a container is not used to virtualize services using the binding. Bindings drive the service management process and must be present and available when defining and managing service configurations. Because of this, Bindings must be added to the Policy Manager Management Console as a prerequisite to using the various service management wizards and access point functionality. For binding types, see Supported Binding Types below. When defining containers to host services, the listener configuration of the container must match the protocol defined in the binding that will be associated with the service. 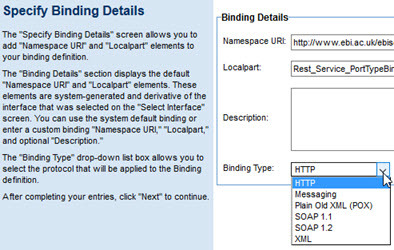 If the specified interface does not contain one of these binding types, a custom binding can be specified by supplying the appropriate XML.